Do you think your school’s student section is the best in Connecticut, demonstrating the best mix of creativity, school spirit, and sportsmanship? NOW’S YOUR CHANCE TO PROVE IT! 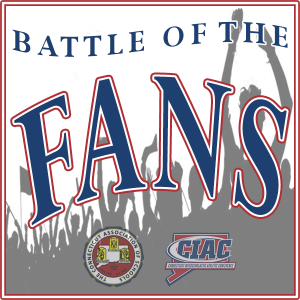 Take part in the 2016-17 CAS-CIAC Battle of the Fans (BOTF) and have your school recognized as the top cheering section in Connecticut. Now in it’s third season, the first two years of the program has been steady success, with numerous schools participating. Sacred Heart earned the title in year one and Cheshire followed it up by earning the honor in year two. Does your school have what it takes to capture the distinction as the best student section in Connecticut this year? This is the chance to find out. Though the competition unfolds during the winter season, it’s not too early to start collecting footage from some fall sports events to be part of a school’s submission. Use the Twitter hashtag #CTBOTF to share ideas and spread the word about your school’s video . Before you get started, you may want to check out these tips on building or growing a great student section. Battle of the Fans is a competition designed to encourage positive fan behavior from school student sections and highlight the great things schools are doing to promote sportsmanship and supportive fan conduct. Student-submitted videos will highlight the school’s commitment to sportsmanship, and school spirit. A panel of CAS-CIAC staff and members of the CAS Student Advisory Council will judge the videos and vote on the winner. Schools should record a video of their student section of NO MORE THAN 3 minutes, highlighting their school’s sportsmanship and school spirit. At least 30 seconds of the video should be specific discussion of why your school should win the Battle of the Fans. Be loud, be creative, have fun! Post your video to YouTube by noon, on Friday, February 17, 2017. E-mail the link to your YouTube video to dmaloney casciac org. Videos will be judged on sportsmanship, school spirit, originality, and student section leadership. Be as loud and positive as possible. Three finalists will be chosen, and the CAS-CIAC team will visit each finalists’ school on a game night. The winner will be announced prior to the CIAC Basketball Championships at Mohegan Sun, and the winning school will be honored as part of the finals March 18-19 at Mohegan Sun. 2/17 – Videos are due to be uploaded to YouTube by noon. 2/22 – Finalists are announced. 2/22-3/6 – CIAC staff visits finalists during game nights. 3/18-19 – Winning school recognized at basketball finals at Mohegan Sun. Sportsmanship and positive student interactions are at the heart of the mission for CAS-CIAC. The Battle of the Fans hopes to inspire and recognize schools that use sporting events as an opportunity to foster a welcoming and fun school climate through supportive and creative cheering and behavior. This is a chance for student leaders to highlight the best of your school and showcase the great things students around the state are doing. Use the Twitter hashtag #CTBOTF to share ideas and spread the word about your school’s video. Good luck, have fun, and be positive. Thanks to our friends at the Michigan High School Athletic Association for sharing the idea. Examples of school submitted videos can be found below, including the videos from our champions from the first two years of competition. You can also search Battle of the Fans on YouTube for inspiration.